This Onirim review was made after playing the game about 20 times. Onirim is a solo or two-player cooperative card game in which you play as Dreamwalkers attempting to find the eight doors of the labyrinth you’re in. Your job is to search through the locations of the labyrinth, find the doors, and get out. Onirim was designed by Shadi Torbey and is published by Z-Man Games. Onirim is all about the three different types of cards found in the one labyrinth deck that you’ll be playing with. There are 58 Location cards in four different colors; 8 Door cards (two of each color); and there are 10 Nightmare cards, which slow you down throughout the game. There are three phases to each turn in Onirim: Play or discard a card, draw back up to a five-card hand, then shuffle the cards in Limbo back into the deck. Each Location card has one of three symbols on it: a sun, a moon, or a key. Each turn you’ll either be playing one of these cards into your Labyrinth Row or discarding a card. As long as you don’t play the same symbol twice in a row, you can play any card. However, you’ll be wanting to play three cards in a row of the same color in order to find a Door of that color. You can discard a card rather than playing one when you’re waiting for a specific type of card to add to your Labyrinth Row. If you discard a key card, you can look at the top five cards of the deck and put them in any order you choose. If you get a Nightmare (see below) or Door card after discarding a key card, you’ll put them in a temporary “Limbo” pile, which gets shuffled back into the deck at the end of your turn. After you’ve played or discarded, you’ll draw back up to five cards. If you draw a Nightmare card, you’ll have a decision to make. If you have a card with the key symbol on it, you can discard it to end the nightmare. If you don’t have a key or you don’t want to get rid of it, you can discard your entire hand or discard the top five cards of the deck (excluding Door or Nightmare cards, which will be placed in Limbo and then shuffled back into the deck). Your last, and worst, option is to lose one of the doors you’ve already found, which will get shuffled back into the deck. If you draw a Door card, you can immediately gain that door by discarding the key card of that same color. If you don’t have that key, then the Door card gets placed in Limbo and will be shuffled back into the deck at the end of your turn. You’ll win the game if you find all eight doors before the deck runs out. Two-player Onirim is pretty much the same as solo play with just a couple of changes. You’ll draft cards at the beginning of each two-player game, with both players getting three cards in their hands and two shared cards will be placed on the table. On your turn you’ll have the option to swap one of the cards in your hand with one from the shared resources to make it easier for your partner to complete a set. Both players need to get a Door card of each of the four colors to win the game. 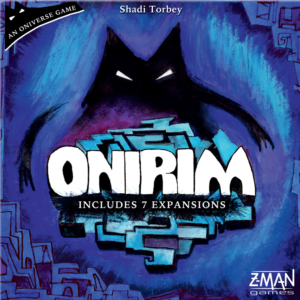 Once you’re used to the base game, you can add in one or more of the seven expansions that are included in this newest edition of Onirim. One of them adds in beneficial spell cards while also making it tougher to get the doors. Another adds in wild cards (good) and Dead Ends (bad). With most of them all you have to do is take the expansion’s cards and just shuffle them into the deck. This is a true filler. It’s pretty cool that I can get a quick 10-15 minute solo game in while waiting for someone else to arrive, then switch to a quick two-player game before we play something a bit meatier. This would be a solid game even without the expansions, but those expansions really do take it to a whole other level. I love that you can easily include one or more of them simply by adding them to the deck and/or setting a few cards on the table. I also like that many of the expansions add to the difficulty, so you can ramp it up as you get used to the game. The base game isn’t too challenging in solo mode once you’ve played a few games, but co-op definitely is. We play with closed hands and with minimal table talk, which seems to be the perfect way to play if you want a tougher game. The box and insert look great and fit the cards perfectly. So. Much. Shuffling! I think these cards are going to break down sooner rather than later. There’s a little bit of cooperation in the two-player game, but not much. It’s still fun, but it really is basically two-player solitaire; some people might actually like that about it. There’s one expansion, “The Door to the Oniverse,” that adds some special ability cards to the deck, but there aren’t any reference cards for it. That would have been a nice addition since most people don’t want to have to check the rulebook every time they get one of those cards. As a two-player cooperative card game, Onirim is just pretty good, in my opinion. As a solo game, it’s friggin’ outstanding! I’m a little let down by the cooperative mode because I thought it had a chance to make it onto our top two-player games list, but I’m certainly not let down overall since this is right behind Friday as my favorite quick solo game. This is the type of game that most people will keep since it’s extremely easy to learn and teach, play time is between 10-15 minutes, and there’s a ton of replay value in the box. I’d even recommend it to people looking for a light and quick two-player co-op. I’m definitely glad I finally had a chance to give this one a try and I’m looking forward to playing Sylvion, Castellion, and the other games in the Oniverse series. Thanks for taking the time to read our Onirim review! To stay updated on all things cooperative board games, follow us on Twitter, Facebook, or via RSS.